When Adele released her second album, 21, in January of 2011, few people could have predicted it would become the music industry's biggest hit in years, selling nearly 10 million copes, landing six singles at the top of the charts and winning six Grammys, including Album, Record and Song of the Year. 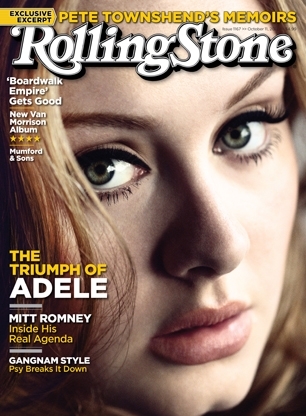 The new issue of Rolling Stone, on stands Friday, October 12th, tells the untold story of the making of a modern classic and includes interviews with Adele's manager Jonathan Dickins, executive producer Rick Rubin, her songwriting collaborator Ryan Tedder and many more – including fans such as André 3000, Aretha Franklin and even Neil Diamond. The album should have been done – but it wasn't, at least in Adele's mind. Listening to the Rubin tracks, she felt something was missing: the exposed-nerve emotional edge heard in the early versions of "Rolling in the Deep," "Someone Like You," "Rumour Has It" and "Set Fire to the Rain." "It's hard to re-create that emotion nine months later," says Epworth. In the end, she made a tough choice: to scrap most of the Rubin sessions, only using four of them, and replace them with the earlier takes. "It took a lot of guts," says Abbiss, who received a call from Adele after her work with Rubin. "She wanted to try to recapture a simplicity from the first time around." They cut "Take It All" and "Turning Tables" in less than a week, on deadline. Rubin admits to being somewhat taken aback by Adele's decision. "I was surprised because she had been so clear about wanting it to sound like it came from one place," he says. "She wanted it to have a consistent band feel so that from track to track, it would sound like the same group of people in the same place – a unified album. I also understood she had been listening to some of the demos for a long time, and that when that familiarity builds, sometimes that trumps all." Rubin compares the situation to his first experience recording with Johnny Cash. "We recorded demos over a long period of time, then tried recording the songs several different ways," he recalls of that album, "but in the end, we decided to release the demos as the album." 21 sounds unified anyway: a nearly perfectly produced and arranged album, gliding back and forth between huffy indignation and tenderness, gossamer piano ballads and retro R&B, wailing beats and bare-boned intimacy.